Every December, students in Pennsylvania and beyond participate in the Hour of Code, a global education event that is a part of Computer Science Education Week. The goal is to promote computer literacy and help students learn computer science in the same way they learn algebra, biology, or English grammar. Computer science skills are a critical part of a curriculum aimed at preparing students for the global economy. Check out this video on coding to learn more about the Hour of Code and just how important it is for kids to learn about coding in a digital world. Parents can learn more about coding by visiting the following websites: code.org or hourofcode.com. Congratulations to Marilyn Pryle, the 2019 Pennsylvania Teacher of the Year. She is an English teacher in the Abington Heights School District in Lackawanna County. Pryle was nominated for the award by students, parents, peers, and members of the community. Ms. Pryle’s students refer to her as a positive role model. “Ms. Pryle has demonstrated her commitment to her students and her profession, and now over the next year she will have the opportunity to engage with educators around the state to exchange ideas and innovative approaches that can benefit our students,” said state Education Secretary Pedro A. Rivera. Pryle is a member of the Abington Heights Education Association, a local affiliate of the Pennsylvania State Education Association. “PSEA congratulates Marilyn Pryle, along with the 11 other exceptional educators named Teacher of the Year finalists,” said PSEA President Rich Askey. As Pennsylvania’s Teacher of the Year, Pryle will meet and collaborate with other educators and represent the commonwealth in next year’s National Teacher of the Year competition. When Denise Kennedy started work as a school secretary in the Upper Darby School District, she figured it was a short-term thing. Twenty-two years later, Kennedy is still the first person parents in her building see and the one who wipes away students’ tears and helps them solve their problems. She is also a key part of her school’s budgeting, purchasing, financial reporting, and data maintenance operations. As PSEA’s Education Support Professional of the Year, Kennedy was recognized at the PSEA House of Delegates in Philadelphia on Dec. 1. She is also in the running to be the National Education Association’s Education Support Professional of the Year. The Pennsylvania Department of Education recently released the Future Ready PA Index, a collection of school progress measures related to school and student success. As part of that rollout, PDE is setting a goal of having 92.4 percent of high schoolers graduate in four years by the year 2030. Pennsylvania has already seen an increase in graduation rates since Gov. Wolf took office, and the governor attributes that directly to increased investment in education. “By investing in education, we have increased the number of children attending pre-kindergarten by nearly 50 percent, increased the number of students in career and technical education programs by 32 percent, and increased the high school graduation rate to nearly 90 percent. These are the positive results we can expect to see when we invest in education, and I am committed to building on this progress,” said Gov. Wolf. The Welsh immigrants who toiled in the mines of the famous Peach Bottom Slate Ridge would be proud of a group of middle school students and two science teachers. The heritage and history of mining the ridge — running from southcentral Pennsylvania to northern Maryland — from the mid-18th to early 20th centuries have been captured in music and videos through a remarkable project involving teachers and students in different school districts. 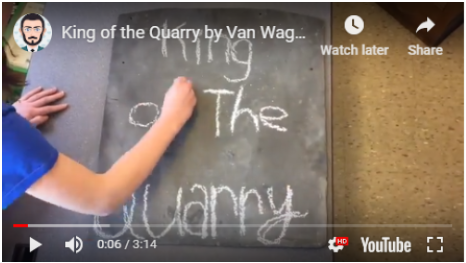 The featured artist on the King of the Quarry album is veteran Pennsylvania folksinger and songwriter Van Wagner who has a day job as a high school environmental sciences teacher in the Lewisburg Area School District, Union County. This story is part of a regular series, “Learning Lessons: Great ideas, Great schools,” that features educators who are doing great things or conducting great programs in Pennsylvania’s public schools. As 2018 comes to an end, remember that Partners for Public Education celebrates the good news in our public schools every day with stories and information you can’t find anywhere else. That is one thing that makes us unique. Make sure you like Partners’ Facebook page to get the latest news you can use on public education and stories about the great things happening in our schools. Look for our #FridayPhotos featuring just some of the awesome things happening in public school classrooms across the commonwealth. And if you have stories and photos to share, please send them to us at partners@psea.org. We love to share the good news in your neighborhood schools. Dolores McCracken, president of the Pennsylvania State Education Association, passed away in early November following a brief battle with cancer. Askey said PSEA members from across the commonwealth mourned the loss. McCracken was a local, region, and statewide PSEA leader for more than two decades, directing her talents and energy toward programs and initiatives that improved both public education and the lives and livelihoods of PSEA members. McCracken was born in New York and raised in Philadelphia. After working for several years as a paralegal, she got involved in public education when her children entered elementary school, serving as the president of the Churchville Elementary Home and School Association. That experience propelled her into a nearly two-decade career in public education, working as a paraprofessional in a sixth-grade inclusion classroom in the Council Rock School District. McCracken was elected PSEA treasurer in 2011, PSEA vice president in 2015, and in 2017, she became the first education support professional member to serve as PSEA president. She led the Association’s legislative and political programs, always focused on improving teaching and learning conditions in Pennsylvania’s public schools. During her tenure, McCracken championed bipartisan legislation to promote school safety, reduce time students spend on standardized testing, and protect dedicated school support professionals from having their jobs subcontracted to for-profit companies. All those initiatives became law. McCracken is survived by her husband Jack, son Jack Jr., daughter Kristin Ellenberger, and grandchildren Dylan, Reese, Logan, and Paige, as well as sisters and many other loving family members and friends. Keep an eye out for some eye-catching plows this winter season as you travel Pennsylvania’s roadways. Students from across Pennsylvania were busy in October painting PennDOT snow plows. Pictured above are plows painted by students from the East Stroudsburg Area School District- Monroe County. Several PA school districts recently participated in a “Paint the Plow” contest, sponsored by PennDOT. The idea behind the contest is to involve local schools in the creation of eye-catching artwork to dress up snow plows. These artistic plows will then be used in local communities to promote safety and awareness for PennDOT. This is an annual art contest that is done in many counties across Pennsylvania. Partner Benefits Spotlight: Need a ride over the holidays? Through your Partner Benefits, get $5 off your first ride with Lyft. This offer is available to new customers only and not valid with other offers or promotions. As a part of Partners for Public Education, you can save money on a variety of products and services with PSEA. Go to the ACCESS website and log in (or create an account using your Partners’ membership number). Then click on the “Local” menu tab along the top, enter your home address, and find savings on dining, shopping, and more right in your backyard.